Prime Minister Datuk Seri Najib Razak officially launched eight packages of the Pan Borneo Highway earlier this week, costing a total of RM12.5 billion. The eight packages make up part of the total 11 packages earmarked for the alignment of the highway in Sarawak, a project which is currently being implemented in various divisions throughout the length of the state. 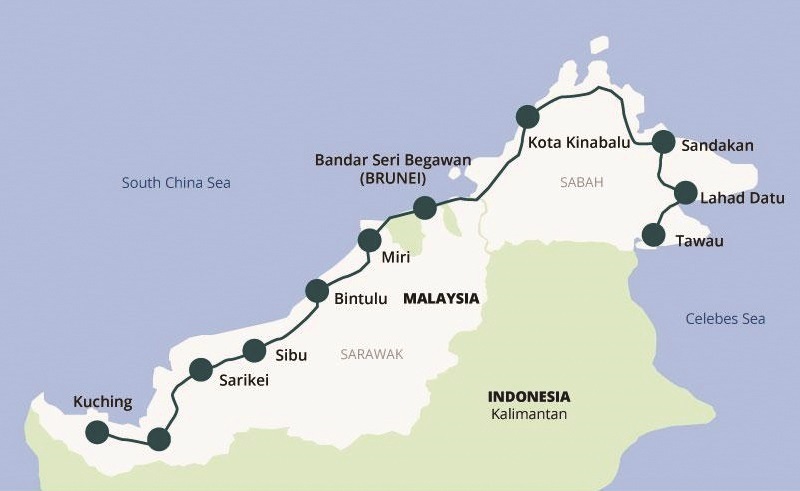 Overall, the Pan Borneo Highway will span some 1,090km in length. According to the project masterplan, the eight packages are Sematan-Sungai Moyan Bridge (95km); Pantu Interchange-Batang Skrang (89km); Batang Skrang-Sungai Awik Bridge (68km); Sungai Awik Bridge-Bintangor Interchange (64km); Sungai Kua Bridge-Sungai Arip Bridge (64km); Sungai Arip Bridge-Bintulu Interchange (65km); Bakun Interchange-Sungai Tangap (77 km); and Sungai Tangap Interchange-Pujut Link Road (80km). According to a Bernama report, the launch of the highway packages coincided with the launch of the 1.48km Batang Sadong Bridge by the prime minister. The RM231 million bridge is considered to be a vital component to improving transit connection in the state and it is expected to spur economic growth in the area. Najib said the bridge was completed two weeks ahead of schedule and the project was completed at a cost that was RM12 million below the initial budget. “Besides ensuring safe travels, it will stimulate economic growth for people in the area, while their agriculture output potential can be increased,” he said at the opening ceremony. To complete the coastal route alignment, Najib said another bridge, costing RM1 billion, was planned to be built across Sungai Batang Lupar. Construction is expected to start in 2018. When ready, the 5km bridge, which is to be built with a 50-50 share between the state and federal governments, would be the longest in Sarawak. Najib said other bridges being planned or already approved to complete the coastal route alignment for comfortable travel include the Batang Samarahan Bridge (estimated to cost RM112 million), Batang Igan (RM300 million) and Batang Rambungan (RM130 million). Seri Fadillah Yusof and Minister in the Prime Minister’s Department Datuk Seri Nancy Shukri.